Midway through the 2013 Lausanne Learning Institute and I already feel re-energized, ready for the school year ahead. I LOVE this conference. It’s where my life was changed nine years ago and I have been back every year since – and for good reason..the learning is great! This year’s event kicked off Sunday with pre-conference workshops and a keynote from Science Leadership Academy Principal and general all around learning rockstar Chris Lehmann, followed by today’s morning keynote from British educator Tim Rylands, who both challenged and entertained the crowd with his masterful storytelling. In between the stories he managed to share a number of ideas about gaming and digital resources with us and, while I had seen/used many of the tools before, there were a few that I am nudged to go back and look at again and a few new ones. Tim shares his resources here. I was inspired when Tim reinforced my belief that personal blogging should be a central component to a student’s school life, a place where they share the best of their skills and passions with the world. I am now excited to get to my “Learning to Blog – Blogging to Learn” session tomorrow. I shared in three sessions today, and four more tomorrow. It’s exciting to see people get excited about what you share. Up tomorrow are a couple of practical sessions on blogging and creative commons and a couple of bigger picture sessions on new approaches to teaching and learning and personal branding on the web. It will go by quickly! I know it’s just another day, but there’s something about beginning a new year that promises an opportunity for growth and learning. As we pack 2012 into the digital archives, we start to look forward to what 2013 might bring – for our world, for our communities and for us as individuals. More and more our definition of literacy will be based on an ability to do more than just read and write text but also on an ability to create and share stories using a variety of media. We have to be not just great consumers of images and video, but competent creators as well. To that end, one of my personal learning goals is to learn more about creating and using images within both personal and professional contexts. With an iPhone and an iPad pretty much attached to my hip and the higher horse power of a Canon T3i at my disposal, today I am starting a 365 day photo journey, where I will select one image from each day and post it to my flickr feed. I will also share several of them along the way on this blog. Of course, as a good digital citizen, all my images are licensed under a creative commons, non-commercial, share-alike attribution. 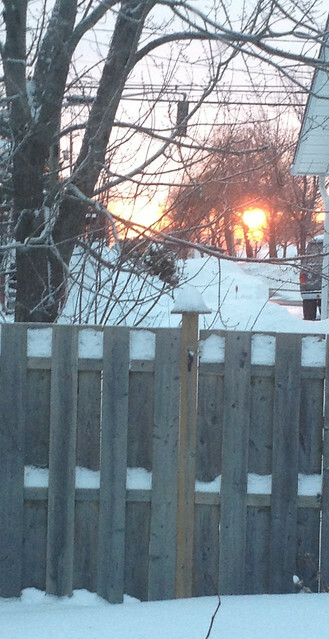 We start with an image from my back window this morning as I watched the sun rise on a new year. 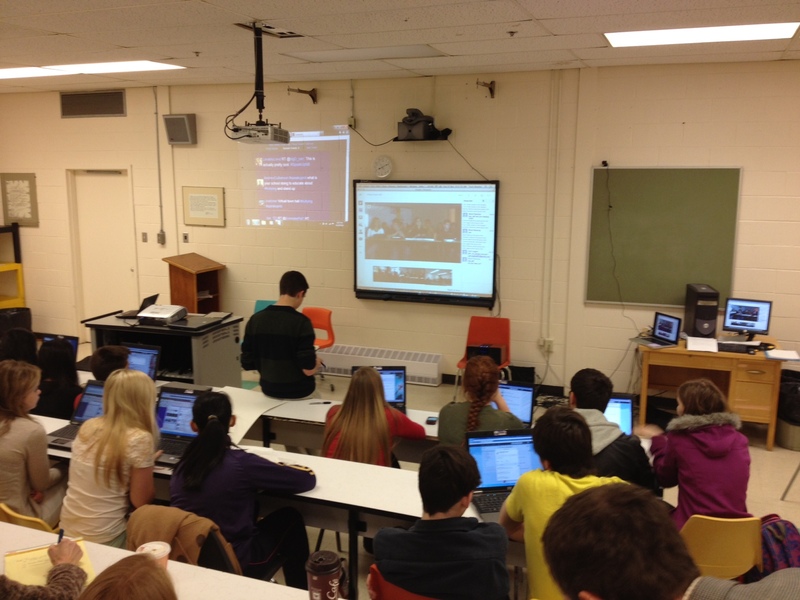 I have been busy lately supporting lots of connections between learners from around the world, but perhaps none more important that the connections I witnessed between students from five high schools in my area during a virtual town hall focused on the issues around bullying. Through the power of technology these students were able – with a little support and guidance from adults – begin a conversation towards making their schools a bit safer and more welcoming places to be for everyone. We used two free platforms for connection, Google Hangout and Twitter. We have in-house systems on our network that would allow the five schools to connect but as we were bringing in a couple of people to share from outside our system, we settled on Google Hangout as the platform for connecting, with a Twitter backchannel – the hashtag #speakupNB was the special glue to bind the conversation together – providing more voice to a broader number of students. After a few minutes of trial and error on how to best coordinate the show, things ran pretty smoothly for a first attempt. Most of the students were being exposed to Hangout for the first time, but they really liked how the platform auto highlights the person / site who was talking. It allowed all sites to focus on the speaker with a minimum of switching. While most of the students were Twitter users for entertainment purposes, they quickly caught on to seeing how tweeting can be used for more serious purposes as well. Each site had two screens – one for the hangout and one for the backchannel twitter feed (we used Twifferfall to bring everyone’s tweets together). Unfortunately, many teachers, administrators and parents see social media as a challenge and not a solution. Fortunately, the St. Thomas University Social Work students and the teachers involved in this project see that the use of social media needs to be seen as an opportunity to connect learners for the answers. Only by infusing a focused digital citizenship component into our curriculum and widely engaging with our students in the digital landscape will we be able to model proper etiquette and the power of the web and combat issues like bullying. A big shout out to New Brunswick Education Minister Jody Carr who, after interacting with the students all morning via Twitter, left the legislature, jumped in his car and joined the students and Fredericton Mayor Brad Woodside for the last few minutes. That effort placed value on the conversations the students were having and will go a long way to encouraging them to continue their efforts. Another amazing day of learning conversations wraps up at the Discovery Education Network Summer Institute in Bozeman. As the chatter of the attendees begins to shift away from digital tools, pedagogy and learning to other more social topics, I am reflecting on this morning’s keynote by Montana educator Paul Andersen. Paul is perhaps best known as the web-based star of a TEDxBozeman presentation that caught attention around the world for his unique ideas around gamifying the learning experiences of his students. I wanted to share a few takeaways from this morning’s talk, which focused more on his ideas around shifting the story of school in his classroom. Takeaway # 1 – Change means something different for everyone. Paul receives many visits to his class and inquiries from teachers who want to replicate his success. They ask him to show them how to do it. Unfortunately, he is reluctant to suggest that he has the answers for them as he passionately believes that each teacher – like each learner – has an individual solution that is unique to them. Teaching is far more an art than a science, with teacher artists all using a different medium and palate to paint the learning in their classrooms. Takeaway # 2 – Classrooms are all that can be fair. Students have many barriers outside the walls of the classroom, from lack of connectivity and resources to family and job demands. We can’t begin to know all their stories. The only time and space we can shape is our classroom environment. Don’t place excessive demands on students to watch videos or do other academic work outside of school. Fairness can only exist when demands on students are limited to their time in school. Takeaway # 3 – Give your students the keys. Learning is a journey. Traditional classrooms are like a bus driven by the teacher. Every student rides the same route at the same pace and arrives at the same time. Paul suggests a better model, one where each student has their own car, take different routes and arrive at different times. But expect this model to be more risky. Kids will crash or get lost. We have to be prepared for that, but we must be prepared to fail for real learning. Takeaway # 4 – Students are not Vulcans. Spock used to teach classes of Vulcan children simply by emptying facts into seemingly unresponsive children. But humans are social by nature and need social elements and connections for learning. Takeaway # 5 – Delay the gratification. As demonstrated in the Marshmallow Experiment, humans struggle with delaying gratification. Teachers needed to be less a guide on the side and more of a meddler in the middle, being involved in the game by providing checkpoints along the way, challenging students to delay the gratification. He noted that those students who were able to exhibit patience in their learning measured best on assessments. Takeaway # 6 – Dipping doesn’t work. Teachers often try and ease their way in to change, only to retreat at the first sign of a challenge. To be successful, teachers have to jump in to the water and start swimming. Only by abruptly switching tracks will teachers go to new places. But, he warns, after you switch tracks, you may not move for a while. Traction takes time. In case you haven’t seen Paul’s TEDx chat, take a few minutes and watch below. Enjoy! After my annual stop in Memphis for the Lausanne Laptop Institute conference last week and a couple of days in New Orleans with my wife and some teacher colleagues, this week I am lucky to be enjoying a week at the Discovery Educator Network’s Summer Institute in Bozeman, Montana. Discovery Education provides a range of services and content for educators. While a couple of districts in our province subscribe to DE, only one of the schools I work with (my former school) subscribes in my district. Luckily I am able to continue to enjoy DE resources through their subscription as a part-time support to their staff (and I also manage the DE account for the school). I am extremely wary of corporate “solutions” for schools. I avoid vendor areas when I attend conferences (I am a bit of a conference junkie). I have resisted collecting the various corporate tags that teachers seem to love to collect, viewing them as cracks in the door to outside influences in the classrooms within which I work. 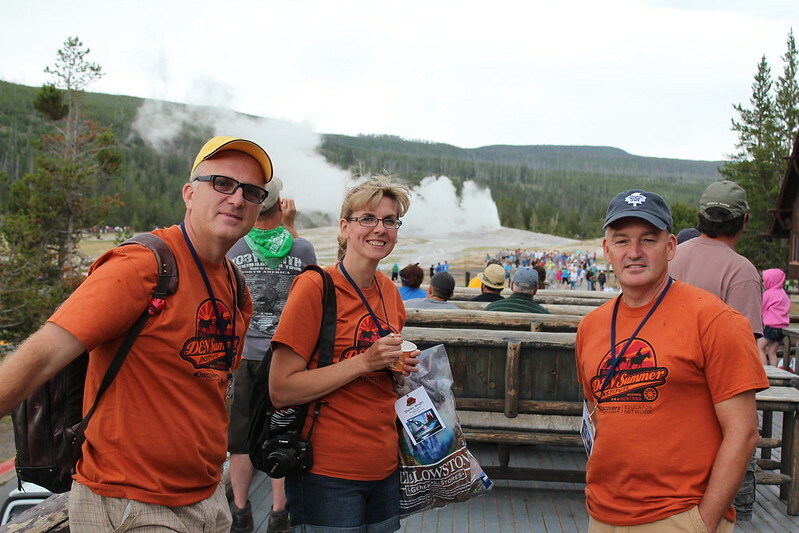 Dean Shareski, Shelley Wright and Brian Harrison at Old Faithful (our Sunday outing), some of the Canadian crowd attending DENSI in Montana this week! In fact, I wasn’t even a DEN STAR – this event is reserved for those with that DEN recognition – when I was invited to come to Montana. I was, however, involved in conversations about building the DEN in Canada – not because I think DE has all the solutions, but because I honestly believe that building a community of connected educators is critical to shifting in the story of education in Canada, North America and internationally and I saw DE’s work as paralleling my passion for supporting building that culture of connection and professional collaboration. So I signed up and here I am. This morning we had a chance to get together for a breakfast conversation with the eight Canadian educators here, along with Canadian community manager Dean Shareski, Tom Metuzals and a couple other members of the Discovery staff. Not that we don’t have a lot to share and learn from and with non-Canadian educators, but we do have our own unique challenges, needs and opportunities and it was great to be able to meet new learning leaders from across the country and build my personal network. On a larger scale, I really am encouraged that this may be the start of a new DEN community within Canada, a community where we can begin to bring new conversations about using digital media and the social web for learning (my personal passions). The DENSI 2012 has been fabulous. A day trip to Old Faithful in Yellowstone National Park, great presentations, opportunities to share informally and build networks are abundant. On top of all that, I had the chance to touch base with my friend David Warlick once again (Dave changed my life on day in Memphis seven years ago!) as he keynoted the opening session. Discovery seems to be genuinely open and supportive of new ideas and tools. I sense that we can all work well together – for learning and learners! Calling all teachers…1001 Tales starts soon! The story begins. An alien king has landed on earth and is threatening annihilation. He challenges the human race to convince him why he should save their earth. “Tell me your stories! !” The students have a challenge…to save their corner of the world from destruction by convincing the king why their community is special and worth saving. The king demands at least a thousand stories. The 1001 Flat World Tales writing project is now accepting learning communities interested in writing with and for classes around the world. Based on the simple premise above, students will be using the power of the web to share their stories with other students from around the world and support each other through peer editing with their partner classes. Beginning in late February, the project will last a little over a month (the schedule is flexible so teachers in the groupings can negotiate the time frames). After registering, classes will be set up in small grade-level based groups to create collaborative groups for our peer editing process. If the suggested time frame doesn’t quite work for you let us know and we’ll work with you to start a workshop a bit later (or earlier) in the year – our goal is to bring together teachers that would like to embed collaborative writing and authentic audience into their classroom experiences. The 1001 Flat World Tales project was initiated as a high school venture by Clay Burell in Korea several years ago (Clay is now in Singapore) and has been going strong ever since. It has since transitioned to the elementary level and, we are hoping, will also have an active middle school cohort this year as well (we are still working on that one, so contact us if you might be interested). No matter what grade level you’re working with, this is a great, easy to implement, collaborative writing project that students love! We would absolutely love to have you join this project with your class! Fill out the online form and you’re in! All materials, resources, rubrics and related information can be found on the project wiki at http://es1001tales2012.wikispaces.com. I am excited to be coordinating this project with Kim Cofino once again. Kim is an amazing international educator, highly respected and well situated in the global learning community and someone who is extremely generous with her time and talents. For more information on the project feel free to contact Kim (email) or myself (email). Hope to see you and your students writing for their lives! As a conference regular I get to take in lots of keynotes. I’ve heard some good ones, a few great ones and, thankfully, only a couple of very poor ones. As part of our recent LEARNEast 2.0.11 conference earlier this week I invited international educator Kim Cofino, who is the Technology and Learning Coach at Yokohama International School in Japan, to share with our gathering of educators. Of course, it’s just not feasible to fly halfway around the world for a few minutes on stage, so – like David Warlick and Jeff Utecht last year – Kim joined us via Skype. I was not disappointed. In fact, her message and passion combined to deliver one of the most thought-provoking and inspiring presentations I have witnessed. In a short and snappy 30 minutes Kim used her personal journey as an educator – and her juxtaposition of the cultures of North America and Asia – to illustrate her vision for the future of education. Having lived and taught first in Germany and later in Kuala Lumpur, Bangkok and now Japan, she brings a wealth of global experiences to the story. Just in time – Asian culture delivers goods and services on a smaller scale and is responsive to demand. 21st Century education needs to look at learning what a student needs to know when they need to know it, not just because the curriculum says they should learn it now. Quick – Asia is fast and quick. Nimbleness is the key to business and life. Kim used the analogy the Asia is like fast food while here in North America our culture is slow to respond to needs (we always did it that way), more like cooking a pot roast. Education needs to be nimble to meet the shifting demands of our students. Customizable – you can buy anything you want in Asia and don’t have to settle for mass produced products. Vendors are willing to customize anything to serve their clients. Our schools need to be customizable for students. No fixed values – In Asia, the value of everything is negotiable, unlike education in North America. With new learning options and delivery models (eg. iTunesU, MIT labs) learners now have options that range in value. This will change value structure of schools and education systems. I've actually visited his market about 15 years ago. It offers customizable foods and other goods 24 hours a day. Can the same be said of our schools? Always on – Asia is open and available24 hours a day. Life/business is available around the clock. In contrast, we remain wrapped up in schedules and bells. We need to move to an anytime, anywhere model by using online synchronous and asynchronous models. Collaborative – Nothing in Asia gets accomplished alone. Even the simplest jobs are done in groups, leveraging the strengths of the crowd. Teaching and learning in our schools needs to be more collaborative. Blending old and new – Kim noted the reverence Asia continues to hold for tradition. Old and new sit side by side. Schools need to look at this model. The trick is to identify which elements of our current schools are of value and worth keeping and mixing into the new story. Global – Asians (unlike North Americans) look outward to the world. Our schools need to be able to bring pieces of all places together, providing global understandings that will allow students to be able to flow easily between situations they will encounter as adults. Flexibility – To survive in Asia, individuals need to be able to adapt to shifting stories. Likewise, our schools need to have the ability to change to meet the changing demands of our students and our communities. Kim was quick to note that life in Asia was not perfect, but as a global educator she saw lots of elements in life in Asia that point to a new recipe for success in the 21st Century, a recipe that learning leaders in our schools and districts need to look to to ensure our schools remain relevant for the future. A special thanks to Kim for sharing her time and expertise. 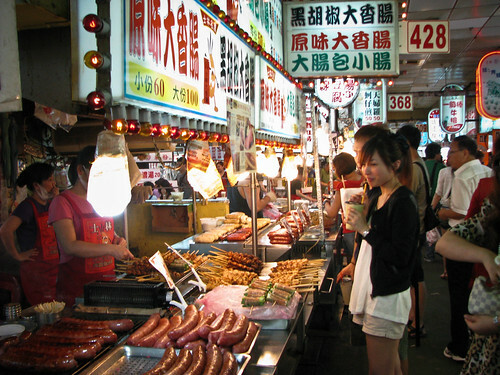 Photo Credit: Shilin Night Markets, Taipei, uploaded to Flickr by Eduardo Mariz. Used under a Creative Commons license. I am such a lucky guy. Next week teachers in my district go back to school in preparation for our students return the first week in September. As part of that return, many teachers are looking to jump start their school year with some late summer professional learning. I have been fortunate to participate and present at several events every year and I know what a learning opportunity exists within the conversations and connections they offer. Having said that, I also know that there are many barriers for teachers to attend events that require travel away from home for several days. Last year I proposed to my district that we look at holding a pre-school professional learning event specifically focused for our six 1:1 schools. It was tagged the 1:1 Bootcamp for Teachers. As demand grew we quickly expanded the focus to teachers from across the province and broadened the sessions to include teachers in all levels of technology-rich learning. We ended up with 120 learning leaders spending a day and a half sharing stories of the transformational impact of technology in their classrooms. With such a tremendous response and positive feedback encouraging us, we continued to expand the breadth and depth of our event. We partnered with a neighboring district, found a few additional sponsors, kept the price right (FREE!) and the model simple. In fact, three of us organized the whole thing. As a result, on Monday and Tuesday of this week we welcomed just under 150 educators from around New Brunswick (and even a few from beyond – one came all the way from the Yukon!) to LEARNEast 2.0.11. Quickly reviewing the data from our on-line participant survey tells us we are doing something right. So, why am I lucky? I am lucky to live and work as a teacher in what is a relatively progressive public education system like New Brunswick’s and, more importantly, blessed to be part of an amazing network of generous colleagues who understand the powerful role technology can, and must, play in supporting a new story of learning for the 21st Century and who are willing to share so freely. I have been to many events and my colleagues in New Brunswick are world class in knowledge, passion and vision around 21st Century education. I want to thank each and every one of them who took the time out of their last week of the summer to join us as presenters and share their expertise. Without such generosity LEARNEast could simply not happen. I particularly want to thank our two keynote presenters, Brian McCain of The Gaia Project and well-known global educator Kim Cofino, who skyped in to share with us from her school-year home in Yokohama, Japan (more on Kim’s message in a later post). Their generosity with both their time and ideas blows me away. It’s this willingness to share that sets individuals like Kim, Brian and our other presenters apart as learning leaders of the 21st Century. I am just lucky to be part of it. See you next year at LEARNEast 2.0.12! Photo Credit: Dice: Lucky Seven, by jfh686, uploaded to Flickr, used under a Creative Commons License. I am in the air over West Virginia winging my way home from my sixth trip to Memphis and Lausanne Collegiate School’s Laptop Institute conference. It’s an amazing event and holds a lot of sentimental value for me as well. It was at my first LI in 2006 that my ideas about teaching and learning – and the role that technology plays in transforming the story of school – were turned upside down by keynote speaker David Warlick. I’ve been back every year since and have usually tried to bring at least a few colleagues from my district with me. 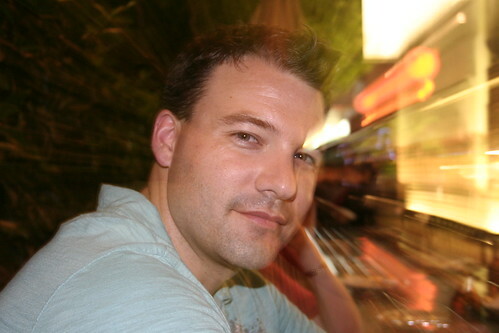 This year’s keynote was Jeff Utecht, who is enjoying a summer stateside from his posting across the western pond at the International School Bangkok. Jeff’s keynote was not just entertaining (which a good keynote should be), but illuminating and challenging. He shared his ideas, asked us to share ours and left us with a couple of questions to think about – why is it (other than the obvious fact that EVERYONE wants to go to Memphis in July during a heat wave! ), when we can learn pretty much anything we want from YouTube, that we still gather together at events like LI and, once we know what we want to get out of the event by answering the why, just what are we going to do to meet those ends? I love conferences. Most of the time I am sharing my experiences as a presenter now, but all that “fame” (sarcasm intended) isn’t what drives me to attend. It’s also not about the sessions (although many are very good I don’t get to see other people present much anymore). What does motivate me to pack a bag, investing both time and money, and hit the road to events are the conversations. I know that in this day of facebook, twitter and skype teachers can – and should – develop and manage an extensive personal learning network where we can connect and converse using these virtual tools, but there is just something about physically sitting down with an old friend or a new one and sharing a meal or a new idea in person. It’s not even about the efficiency; it’s about the trust. Somehow the professional relationship changes after you have met someone in person. In a session on managing successful global collaborative projects, I encouraged teachers to look around the room or around their table at lunch to build a network that they can leverage for not just their learning, but their students as well. Most of the most successful global collaborative projects I have been involved in with teachers and students in my district, with schools from Mumbai to Ft. Worth, were born from connections at events just like the Laptop Institute. Learning from my network online is great. The constant chatter amongst educators on Twitter provides fuel for many short learning journeys, but the real tank-topper – the big high octane fuel truck that fills me up for the long haul – are the conversations and connections that come from conferences. To all my Laptop Institute friends, thanks for the fill up and we’ll see you in 2012 for year ten! As we move into the heart of the digital age, more and more of our lives are accessible to the world. It used to be that we followed the old adage “do no harm” when it came to sharing our thoughts on the web. We spent a lot of time telling kids – and each other – what NOT to do on the web. Over the past few months I have had several occasions to chat with students – both high school and university – and adult learners about the need to develop and manage their personal digital brands. We can’t just live by the old adage of “do no harm” anymore. Our young people need to learn the skills to actively manage their digital footprints to leverage against their future. We – our students and ourselves – need to be “google-able”. Students respond to this message. They love to hear that their web has value and is not just something that can only cause them harm. The message is simple, yet powerful; they not only can, but they MUST take control of their web presence, nurturing it through consistent use of social media and other web tools to present their story to the world. With most employers and post-secondary educational institutions now searching prospective applicants, the need to create a positive web presence falls to the individual. This can happen in multiple ways, but the initial steps I recommend are surprisingly simple. Email – Before we even get to the web presence, one of the biggest mistakes an individual can make is to use an unprofessional email address. As an instructor, I still receive emails from university students using email address like “sexysarahxoxo <at> hotmail”. I wouldn’t think it would be a stretch for those same students to use that same email to submit a job application to an employer. Bad move. The solution is easy – get yourself a professional personalized email that builds your brand. What’s your brand? Well, my suggestion is that your name makes a real nice brand. While you are at it, go to Gmail (or another site with more professional recognition) and leave Hotmail for SexySarah. The three solutions I promote next go hand in hand; common branding (usernames) across social media platforms, a web-based digital portfolio and a personalized domain name for your portfolio. 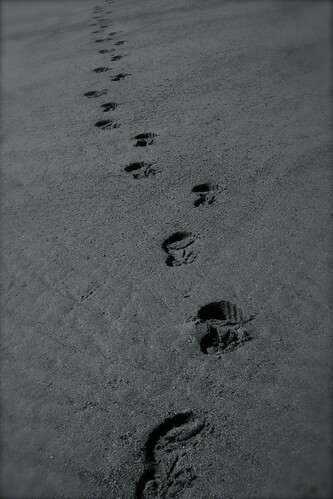 Taking control of your digital footprint / web brand starts with recognizing that your social media presence is a calling card for today’s connected community. Your Facebook, Twitter, LinkedIn and other platforms all converge with your other web content to build your brand. By using a common username across platforms, you will build links and profile across the web. What brand to use? I encourage people to use their name? It’s their original brand and people more closely attach their recognition of your ideas to your name. The most powerful person to tell your story is you! By building and managing a more formal web presence – for lack of a better term we can call it a “portfolio” – you can share your story with the world. I think blogs – WordPress is my suggestion – are a tremendous platform for hosting these portfolios (see an example from an undergrad BEd student). Ideas and new learning can be continually shared on the blog while other ideas and artifacts live on accompanying pages. Wouldn’t it be great to see every school start individual student blogs beginning in elementary grades, building on content and skills through middle school and resulting in a full fledged web-based portfolio for graduating students, ready for perusal by the world. While we are building the branding idea, what speaks louder in a web-based world than a personalized domain? My blog/website is located at jeffwhipple.ca. It’s not about vanity, it’s a conscious effort to link my brand across platforms and build a digital profile. Domain names are cheap (generally less than $15 a year) and easy to link to blogs or Google sites. Again, your name is a great brand and it works nice if it matches your social media username. I can think of no better graduation gift we could give to high schools graduates than a personalized, individually constructed and managed portfolio with a personalized domain purchased for three years. The message?…go forth, tell your story and prosper. It’s not an option anymore.